The following is sponsored by FitFluential on behalf of Verizon. 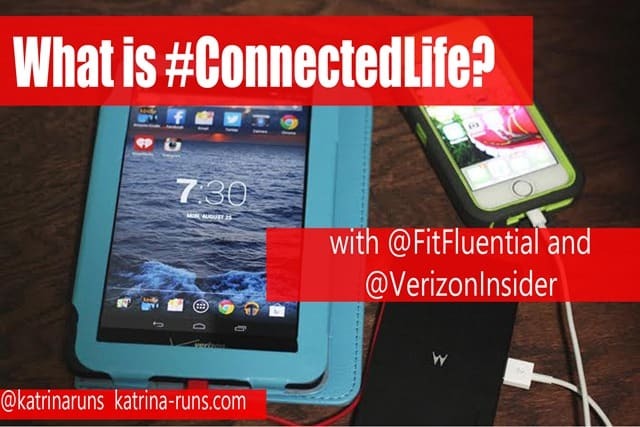 For the past few weeks, I have been working with Verizon on the Connected Life campaign through FitFluential. Each week, there is a Twitter chat with Verizon on a specific way to use technology and mobile service in our every day Connected lives. If you haven’t seen these on Twitter, take a look at what we have been talking about on our recent chats. July: Tech to go andmusic for fitness dominated our July chats. There were a lot of great tips on taking our technology with us. These air travel tips and apps come in handy when flying. Looking for a bluetooth device to listen to your music and take those important calls? This LG Tone Pro stereo speaker will work great! August: It is back to school and we talked about educational tools using smart devices. Love NFL? This mobile app will appeal to you. Speaking of education, do you have young drivers going to school or college? Or what about easily distracted drivers? Do you know there are apps to block texting while driving? Are you a new college student in a dorm for the first time? Do you have a tech checklist? September:This month, we talked about ways to turn your home into a Smarthome. Examples include information on how to urn on the lights, set the alarms, and keep eyes on the inside while you’re away. Want to print pictures from your phone? This will tell you how. Looking for a new smart phone? This Mom-of-4 explains the finalists and her final decision.Wearable fitness technology? Verizon has some ideas. After 3 months of great apps and ideas, but not enough battery power on your device? This Motorola Power Pack Slim 4000 will charge 2 devices at one time. As you can see, there is much more to Verizon than just cell service. And while it is the best service in my opinion, keeping connected in this day and age is often just an app away. Keep up with all the FitFluential Twitter Chats with @VerizonInsider by checking in on the FitFluential Blog.